TOMORROW IS THE LAST DAY OF SCHOOL!!!! On Saturday Pepper, Lupie, and I got our hair cut and I got mine dyed. 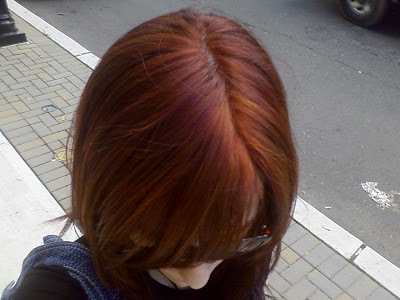 My hair dresser put something like seven gradiated colors in it to make this gradual transition of reds to dark purple underneath. It looks less purple and more black on the bottom. It's very pretty, and the cut is great, but I don't know if it's wild enough for summer - I'll see how I feel. Pepper's been working hard at her pretty new-to-her house. I love it. It has fantabulous landscaping. I went by on surprise today with Mr. G to invite her and Mr. Pepper out to eat at a local Japanese place but they had company so Mr. G and I went without them. 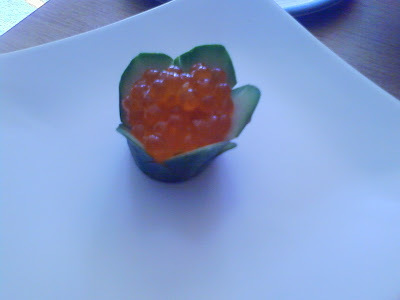 We ate at Fuki (I love the name) in River Edge, NJ. This was the best Japanese I've had in a long time. 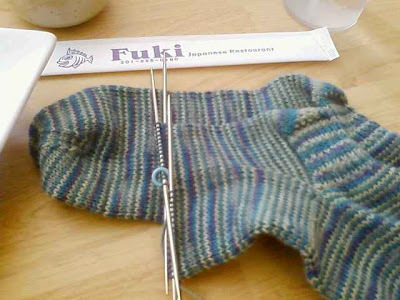 Here's a shot of the Mary socks on the table at the restaurant. The fish was so delicious and tasted fresh. Usually when I hit a Japanese place on Sunday, most any place, for whatever reason I feel the fish is only okay. This fish rocked. The service was nice, very attentive. It was priced similarly to most places in the area (Wasabi in Ridgewood is another good one, but this one is way cuter and much more homey.) I had a sashimi platter - the white tuna was awesome. Look at how they served my salmon row. And watch for Suckie's grandma's knitting. 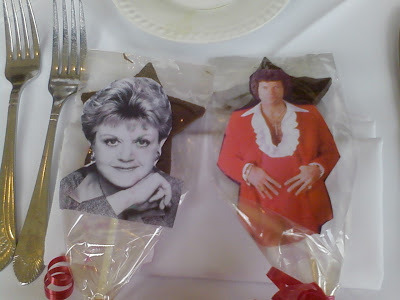 The "Murder She Wrote" lollipops- that's hysterical. It doesn't even have to be an inside joke to be absurd enough to be funny. How did I miss this post!